Daniel……Florida Senate: Governor Crist’s Senate Campaign Chairman, former Florida Senator Connie Mack (R-FL) QUITS …..
POLITICO reports that the Chairman of Governor Charlie Crist’s (R-FL) Senate Campaign, former Florida Senator Connie Mack (R-FL) HAS QUIT the Campaign. *** What does Crist do? First Read has learned that Crist is getting much of his political advice nowadays from GOP strategist Mitch Bainwol, and they are considering two options right now: 1) making an independent bid, which would turn the general election into a toss-up; and 2) dropping out of the race altogether and turning his sights to a 2012 Senate challenge against Bill Nelson (D). But right now, no one is seriously talking about Crist staying in a GOP primary he’s trailing by double digits. The filing deadline is at the end of this month. PLEASE CHARLIE, DROP OUT AND RUN AGAINST BILL NELSON IN 2012. I second that!…….Drop out Charlie…so Meek can run against Rubio! The filing deadline is at the end of this month. Daniel……Florida Senate: Governor Crist's Senate Campaign Chairman, former Florida Senator Connie Mack (R-FL) QUITS …..
Hello Dog Folks and Good Morning! What will Florida Governor Charlie Crist (R-FL) do with his Senate Race? 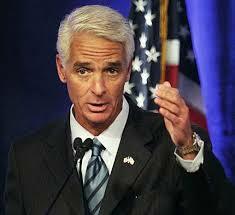 There is now INCREASING Speculation that Crist could just change his mind and run as Independent in November. The Wall Street Journal reported just YESTERDAY that Key Advisors of the Crist Campaign pushing for an Independent Senate Bid AND Crist himself dodged a Question on the Senate Race to a Reporter in Tampa. On the heels of all this buzz Quinnipiac University is out with a Survey today showing Crist would do MUCH BETTER should he decide to run as Independent. Crist leads Rubio in a 3-way Race for the General Election in November BY TWO POINTS. IF Crist runs as Independent Meek is the BIG Loser. IF Crist stays BUT also wins the Republican Primary Meek is FINISHED too. A Rubio – Meek Race is currently a Toss-Up. One interesting Caveat: How will the Health Care Issue play with Florida Senior Voters come November? MEEK IS SO STAUNCHLY LIBERAL that regardless how the Numbers against Rubio look like today I’m still not nervous. The DSCC WILL CEDE Florida come August. Meek won’t get one Penny from them. Daniel…..Crist as an Independent in Florida’s Senate race? Governor Crist Political Advisors pushing him to ABANDON his Republican Primary Campaign and run as Independent. After putting up a Statement just last week saying he wouldn’t run as Indie Crist today dodged a Question about his Political Future. The Filling Deadline in Florida is April 30th. The Florida Legislature Session ends this month. Quinnipiac to release Florida Poll early tomorrow morning on the Florida GOP Primary as well as testing Crist as Republican and as Independent in the General Election. Daniel…..Crist as an Independent in Florida's Senate race? The Dog is watching the Crist and Rubio do their dance……. If Crist stays in this race as an Independent…..
I’m not sure whether or not to trust this release. On the one hand, it sounds pretty firm, but on the other hand, if Crist really is thinking about running as an Independent, of course he’ll deny it right up the last second. Surely he learned a lesson from the Lieberman in-primary backlash. One also wonders why he would mention Teddy Roosevelt in his press release in this day of Tea Parties. Glenn Beck has demonized TR, turning him into one of America’s most feared historical enemies, and the GOP primary base is eating it up. That sounds more like general election talk than Repub primary speak to me. Marco Rubio hits a bump….little or large? Here’s the piece from Politico.…..
Florida politics is abuzz today with the leak of the statements for a Republican Party American Express card held by Marco Rubio, which shows some charges for things that look like personal expenses. Rubio quickly denounced the story as a low blow from the Crist-controlled party, and he has the advantage that the sums he’s accused of spending are far lower than those Crist’s allies at the parties spent. But the way this kind of story can become truly damaging — for him and for other Florida Republicans — is if it emerges that they spent party money on their own and didn’t pay taxes on the imputed income. It’s often the taxing, not the spending, that brings pols down in situations like this. From Merlin…..Rubio catches Crist in Florida's US Senate Race!…..
What a stunner: Rubio takes lead over Crist for the first time in a scientific Poll. Just to recap this Race: In June last year Florida Governor Charlie Crist led Rubio by 31!!! Points. Crist’s Job Approval is pegged at 50 % right now. What a difference 7 months makes. So what’s Crist going to do now. Drop out? That would be odd. Pull a Lieberman and run as Independent? That seems odd too. He’s in a world of hurt right now. Crist made one colossal mistake: He endorsed Obama’s Stimulus Plan and then didn’t watch over to other States like Pennsylvania . We’re now seeing the same Trend that happened in Pennsylvania when Specter was still a Republican…..happen now here in Florida. Specter looked at his Numbers, pulled the trigger, and switched Parties because he couldn’t win the Republican Primary. Will Crist do the same? I doubt it. What’s clear is that he won’t win the GOP Primary because Conservatives, who only can vote in those closed Primaries, view him as too moderate. Look for Rubio stretching out his lead over the coming months. Republicans can only hope should Rubio win the Primary that he doesn’t move to far to the right because if he does there’s a slight chance Meek could benefit from that and pull out one of the biggests upsets this Cycle. For that to happen the Political Climate for Democrats needs to get better somewhat. Quinnipiac is likely to release a Florida Governor Poll tomorrow morning. The Dog is so happy for Marco Rubio!……and hopes he goes on to send Crist packing…..Merlin does not point out that difference between Crist/Meek and Rubio/Meek is what the Democrats and Meek people are happy with….Meek is only 9% points behind Rubio verses 12% behind Crist…Merlin is correct in worrying that a Rubio / Meek race would be much tighter than a Crist / Meek race…. From Merlin…..Rubio catches Crist in Florida’s US Senate Race!…..